For the past 25 years Manilla Paragliding has been the Australian Importer for the worlds leading instrument brands - FLYTEC, NAVITER, ASCENT and JDC. We are the ONLY Australian importer with an on site tech and service/repair facility !!! No need to wait weeks or months to have your instrument repaired or warranty replaced - nearly all repair can be carried out right here in Manilla. FLYTEC of Switzerland is by far the worldwide #1 manufacturer of air sports flight instruments and accessories. Over the past 30 years they have R&D'd and patented all of the technology used in light weight flight instruments. FLYTEC offers a complete range of instruments and accessories for Paragliding and Hang Gliding as well as Ballooning, Ultralights, and Powered PG/HG. The GPS integrated units also include fully FAI approved flight recorders for record and competition verification via secure IGC files. NAVITER of Slovenia is the maker of the unequaled OUDIE series of full flight instruments. The OUDIE is now joined by its smaller yet equally capable HYPER. NAVITER and FLYTEC recently merged. The OUDIE/HYER series serves all levels of pilots including glider pilots with the IGC model. Please go to the OUDIE/HYPER page directly : Click Here ! ASCENT vario from the USA makes the worlds best mini vario/GPS. If you are seeking a compact light weight instrument then look no further. Its fully featured and weighs only 93 grams !!! Please go the ASCENT VARIO page directly : Click here ! JDC of Switzerland patented the contactless turbine wind speed measurement technology in the late 1980's and manufactures a large range of instruments for many applications. Godfrey's Manilla Paragliding is the Australian importer for FLYTEC, NAVITER and ASCENT VARIO. Dealer enquiries are welcome. Please contact Godfrey directly for sales : ph 02 67 85 65 45 or email click here. The new ELEMENT SPEED replaces the well known 6000/6005 base model at the same price. It adds some GPS functions such as speed, glide, thermal pointer, wind direction, distance from take-off. It has 3 altimeters, digital and analog variometer, user customizable audio with Smart-filter technology, 5 full-time data fields, always-on realtime clock, louder audio with 5 settings, battery life over 45 hours (2xAA), superb ergonomics and styling; very compact and light. Larger and simpler keypad (4 keys). Optional leg strap or cockpit mount $25. For full product information click here. The new ELEMENT TRACK is an upgraded replacement of the successful and reliable 6015 model. New features include : larger and improved readout on LCD display, airspace warnings, more tactile keypad for easier use with gloves. It combines the same integrated super sensitive 20 channel GPS into a entry level instrument but with high end features. Automatic tracklog recording up to 50 flights and 291 hrs, user customizable audio and flight function, track compass with wind speed and direction, USB interface, FlyChart compatible, and user upgradeable, 40 hour battery life on just 2 AA, and all in the same case size as the 6005 ! Optional leg strap or cockpit mount $25. For full product information click here. The all new P1 is a touch screen, GPS and wifi enabled flight instrument of the newest generation - a smart vario just like your smart phone. Long battery life, daylight readable display, robust case and ease of use are its prime hardware features. The unit auto-updates new software and features whenever it is in wifi range. The unit will auto-update to activate new free features as they become available. The P1 functionality is being updated /added to over time. Currently it has all features except a ASI Pitot (for HG pilots) and mapping. Both are expected to be available at some stage in the future. For more info on the available features click here. 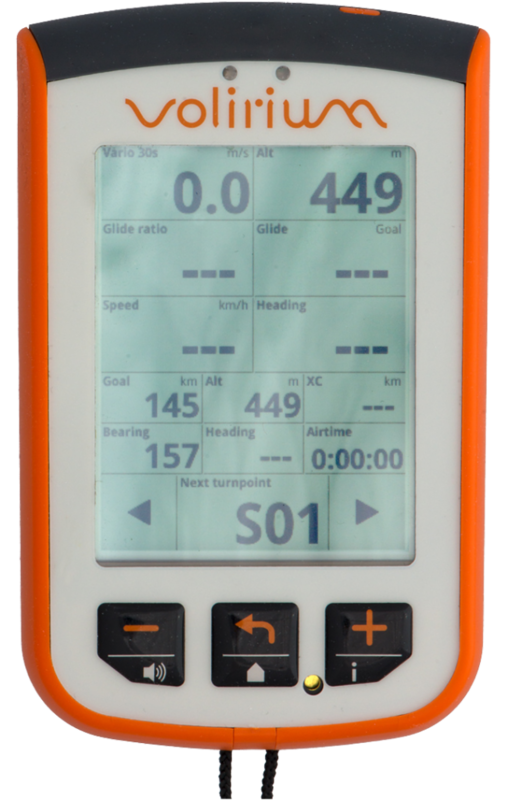 The 6030 is the flagship GPS integrated instrument which does the lot using state-of the-art technology. It features a integrated 16 channel GPS, audio and graphic McCready speed-to-fly, advanced final glide functions, unsurpassed competition route function, data logger with up to 290 hrs. record time, extended pitot speed range (12-180 mph), USB interface and FlyChart compatible, user replaceable batteries NiMH on alkaline (2 banks of 2 AA), dual internal chargers, SD memory card slot for future implementation. NEW - optional FLARM module for collision avoidance. For full product information click here. FAIRHAVEN MICRO RRP AUD$155 NEW Product !! In stock. Small light weight audio only back up vario. Great also for hiking and tandem operations. Adjustable sink and rise time acoustics. Flytec no longer makes the WINDWATCH series. We now stock the JDC SKYWATCH. The Xplorer1model is very similar to the basic WINDWATCH - a small pocket size instrument to precisely measure wind speed (multiple scales). Waterproof. For full product information click here. Vane type Airspeed sensor for Hang Gliders. Mounts on base bar or down tube. Suits all FLYTEC vario's. Vane type airspeed sensor for Paragliders. Mounted in an aerodynamic housing to dangle below pilot in clear airflow. Suits all FLYTEC vario's. Hang Gliding instrument mount for all FLYTEC varios. Full swivel with velcro attached rubberised base for down tube ot base bar mounting. Paragliding instrument mount for 6005 and 6015 model FLYTEC varios. Mounts on harness straps and has tilt/angle adjustment. Also suits Garmin 72 and 76 series GPS instruments !! !